For those of you who have not discovered the full range of Bollywood this movie will have no meaning for you. Too bad. It reminds me of many pleasant memories. It has no stars to draw a crowd or the usual masala mix.. It is based on a best selling book. It is just about three guys who stick together through a lot of problems plus a sister who does complicate things a bit. Chetan Baghat who wrote "The Three Mistakes of My Life" that the movie is based on is an author I really discovered when he was being discredited for supplying the basic idea in the novel, "Five Point Someone" for one of the best ever Bollywood movies, "3 Idiots" This movie is not to be confused with the Three Stooges, but it certainly does have a sense of humour. One of the driving forces behind "3 Idiots" was the book Chetan wrote regarding his training at an engineering university. A concern in the movie was the number of suicides from students. It made a serious point with humour and a little mystery. "Rock On", an earlier movie directed by Abhishek Kapoor was basically a movie about four friends joined together by enthusiasm for music. The music should not be confused with stereotypical Bollywood music. Actually composed by my favorite musical team, Shankar, Ehsaan Loy, a very diverse team. Rock On marked a role by director/producer Farhan Akhtar who also did his own singing. By one report apparently Farhan and Abhishek parted company after "Rock On", but have since reconciled after "Kai Po Che". The four stars Sushant Singh Rajput, Amit Sadh, Raj Kumar Yadev (better known as Rajkummar Rao) and Amrita Puri were not picked for their ability to attract fans, but all accounted themselves well. The emphasis is on the story. It may seem dull to Westerners, but it is not really. The personalities of the four main actors clash and blend. They are involved in historical events particularly an earthquake, religious riots and a major international cricket match. The music by Amit Trivedi fits in well with the story. It won't take long before you are engrossed. 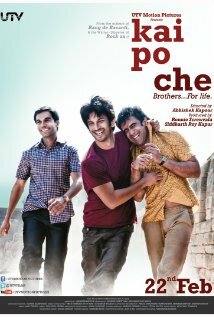 It is not often that a movie without major stars does as well as "Kai Po Che", but the director puts a lot of emphasis on the story. Commemorating 100 years of Indian film Abhishek made some introspective comments. He felt that Bollywood is too much of a family making it difficult for outside talent to break in. Movie people look down on television, but Abhishek thinks that is where new talent can be found. Movies depend too much on music and Bollywood relies far too much on song and dance. He feels also that intermissions are harmful in that they force too many scripts to conceptualize over two parts for the sake of popcorn and samosa sales. He dislikes the role of censor and thinks they should be replaced by a ratings system. I think Abhishek marks a step in the right direction.